Coffee #1 | Who let the dogs in? - Coffee#1 did! At Coffee#1 we strive to be as inclusive as possible to all who wish to enjoy our fantastic products. 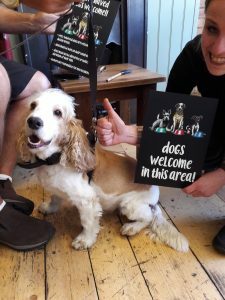 After much deliberation and discussion with local food safety bodies, we have taken the decision to welcome well behaved dogs into specially designated areas of each of our stores, excepting those in city centres. We could not be more delighted with the overwhelmingly positive reactions we have had to this recent announcement, and we are really enjoying all the photos customers are sending us of their good dogs enjoying a ‘puppyccino’* with them in their favourite spot. This is Ned waiting like a good boy for his Coffee#1 treat! Eligible stores will have signposting advertising a dog friendly area and will provide water bowls and the occasional treat for our new 4 legged customers. For anyone concerned that this will impact the atmosphere or cleanliness of the stores, do not fear. 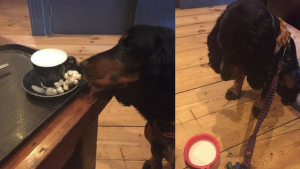 We have a strict policy in place ensuring that the doggy area is away from all counter and food prep areas, and have provided guidelines to our baristas on what to do should a dog be poorly behaved in store. We are confident that our new dog-friendly crowd will enrich the current community of loyal Coffee#1 customers who make us so pleased to come into work every day! Coffee#1 Bridport’s first canine customer is a cutie!